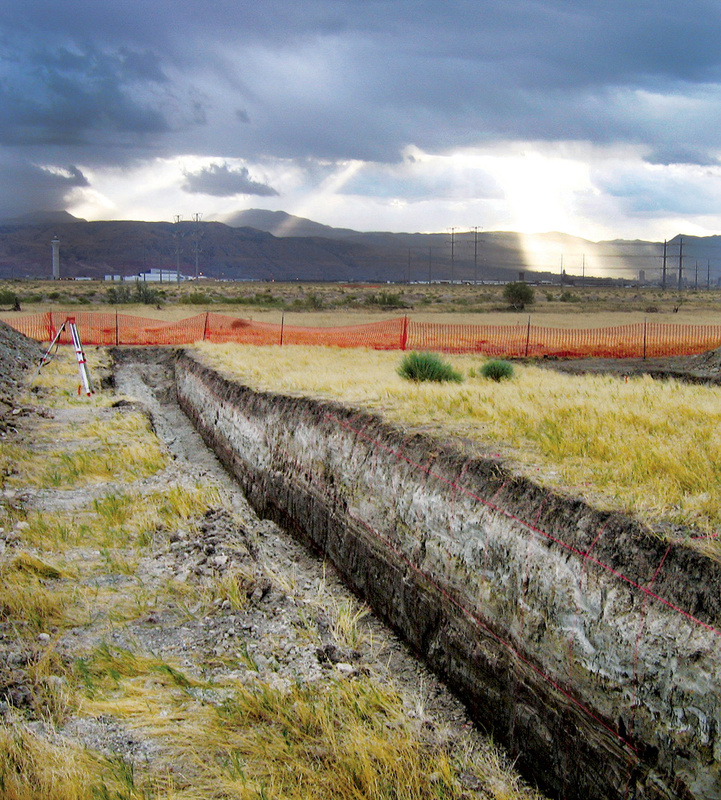 Eastward view of research trench across a small (about 3 feet high) fault scarp on the West Valley fault zone in Salt Lake Valley. Photo by Michael Hylland. Mike Hylland has been a geologist with the UGS since 1994, and splits his time as a UGS technical reviewer and Geologic Hazards Program researcher. Current projects include paleoseismic studies, geologic mapping, involvement in various earthquake working groups, and management of Utah’s database of active faults. 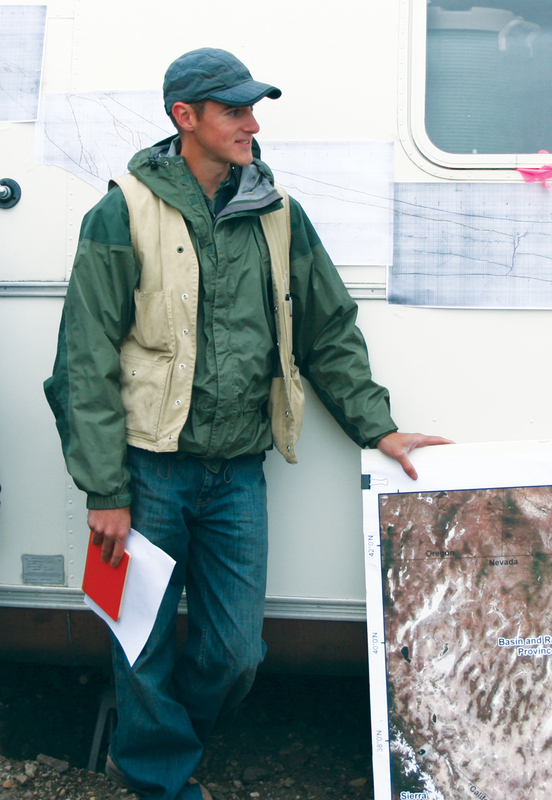 Chris DuRoss has been a geologist with the UGS Geologic Hazards Program since 2004. 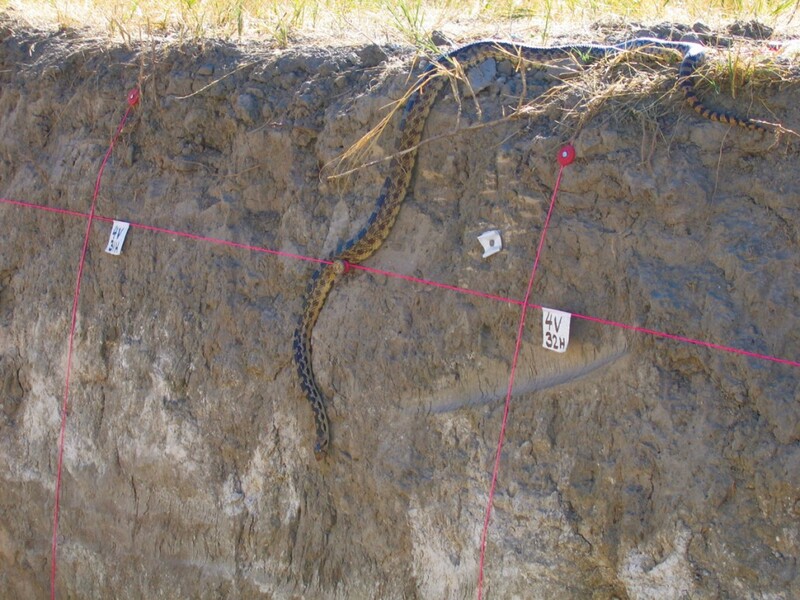 He specializes in studying geologic evidence of large, prehistoric earthquakes in Utah, and has completed several fault-trench investigations on the Wasatch fault zone. He is also part of a working group tasked with assessing the probability of a future large earthquake in the Wasatch Front region. 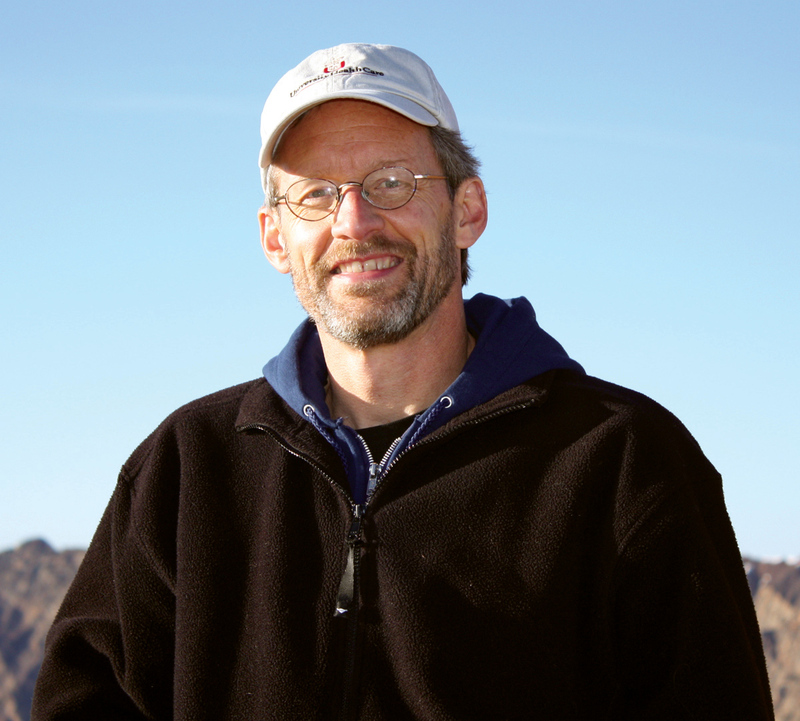 Greg McDonald has been a geologist with the UGS Geologic Hazards Program since 1998 and has been involved with many of the UGS’ paleoseismic studies performed during that time. 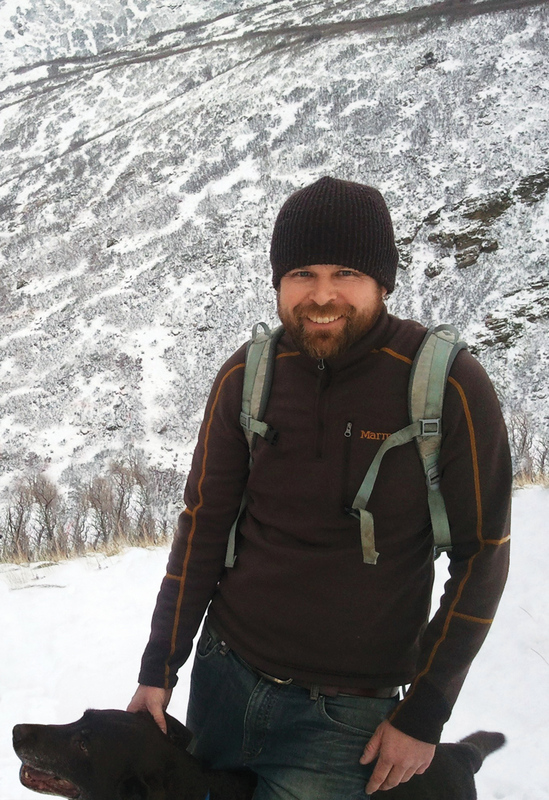 Greg has also worked on a variety of other projects including landslide, debris-flow, and rock-fall investigations, surficial geologic mapping, earthquake groundshaking-related studies, and landslide inventory mapping on the Wasatch Plateau. The Wasatch fault zone has long been known to be a serious earthquake threat to the Wasatch Front region. In Salt Lake Valley, strands of the Salt Lake City segment of the fault zone pass directly through Utah’s capital city. However, another possible source of large (approximately magnitude [M] 6.5) earthquakes lies just a few miles west of Salt Lake City—the West Valley fault zone, comprising a system of faults on the floor of northern Salt Lake Valley. Like the Wasatch fault zone, the West Valley fault zone shows evidence of recurrent movement in the geologically recent past (i.e., the past 10,000 years). But unlike the Wasatch fault zone, which has been the subject of dozens of detailed scientific studies, relatively little is known about the behavior of the West Valley fault zone. 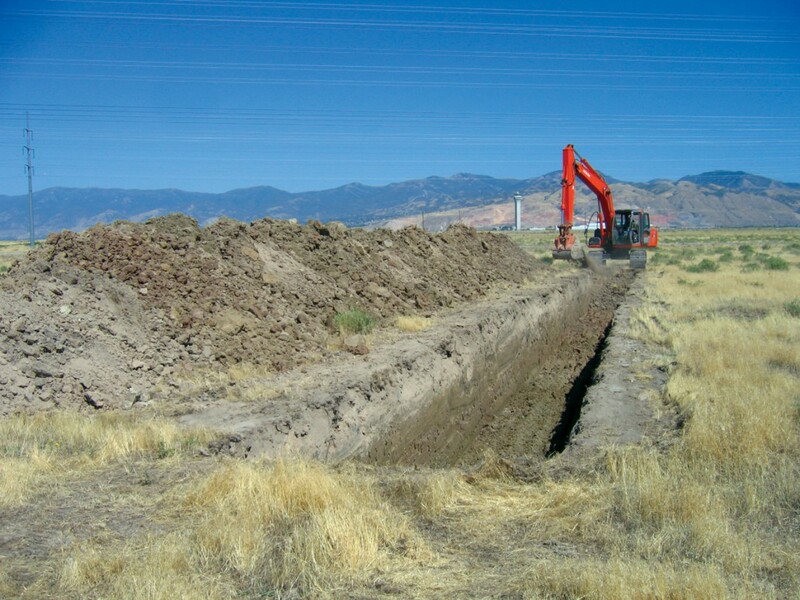 The Utah Geological Survey (UGS) recently conducted paleoseismic (fault trenching) studies of large, prehistoric earthquakes on the West Valley fault zone (Baileys Lake site; September 2010) and Salt Lake City segment (Penrose Drive site; May 2010). In addition to UGS geologists, the investigative team included geologists with the U.S. Geological Survey, URS Corporation, and Kansas State University. The new data collected during these detailed studies will allow us to better characterize earthquake activity on both fault zones. We can then compare the timing of past earthquakes on the two fault zones––an important step in improving our understanding of how the fault zones interact and what kind of earthquake activity to expect in the future. The West Valley fault zone is antithetic to the Salt Lake City segment; that is, the fault plane of the Salt Lake City segment slopes westward beneath Salt Lake Valley, whereas the fault plane of the West Valley fault zone slopes eastward, toward the Salt Lake City segment. Important questions pertain to the seismic relation between the two fault zones: When the Salt Lake City segment moves and generates a large earthquake, does the West Valley fault zone also move at the same time? Or can the West Valley fault zone move independently of the Salt Lake City segment, and therefore need to be considered a separate source of large earthquakes? The answers to these questions have significant implications for the seismic hazard of the greater Salt Lake City metropolitan area. At the Penrose Drive site, immediately north of the University of Utah campus, fault movement on the East Bench fault of the Salt Lake City segment has created a steep scarp about 30 feet high. 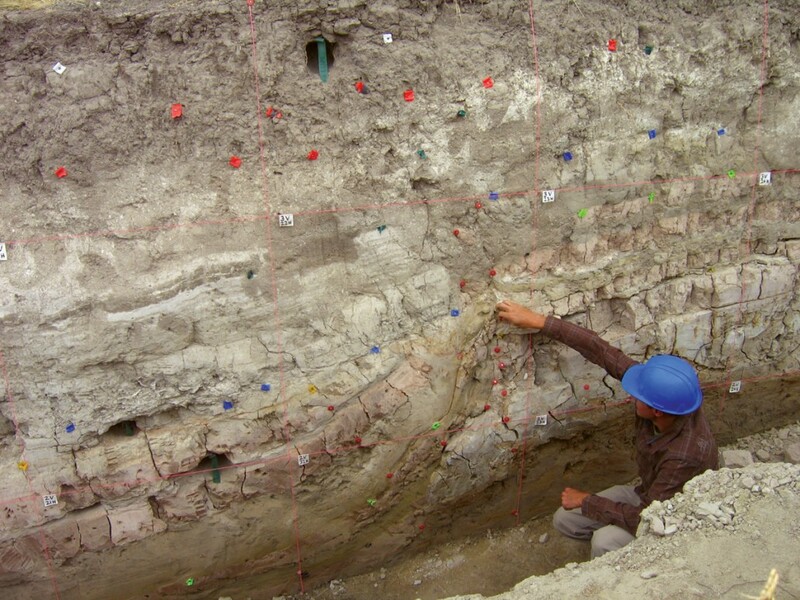 We excavated two trenches across the scarp and exposed geologic deposits as old as 60,000–70,000 years, including deposits resulting from surface faulting dating back to about 17,000 years ago when the site was along the Provo shoreline of late Pleistocene-age Lake Bonneville. Geologic evidence indicates five or perhaps six postProvo earthquakes, each one displacing the ground surface vertically by about 3 to 6 feet. The older (pre-Bonneville) alluvial fan deposits have been displaced vertically by at least 52 feet. At the Baileys Lake site, immediately west of Salt Lake City International Airport, movement on the Granger fault of the West Valley fault zone has created two parallel scarps 1 to 3 feet high. 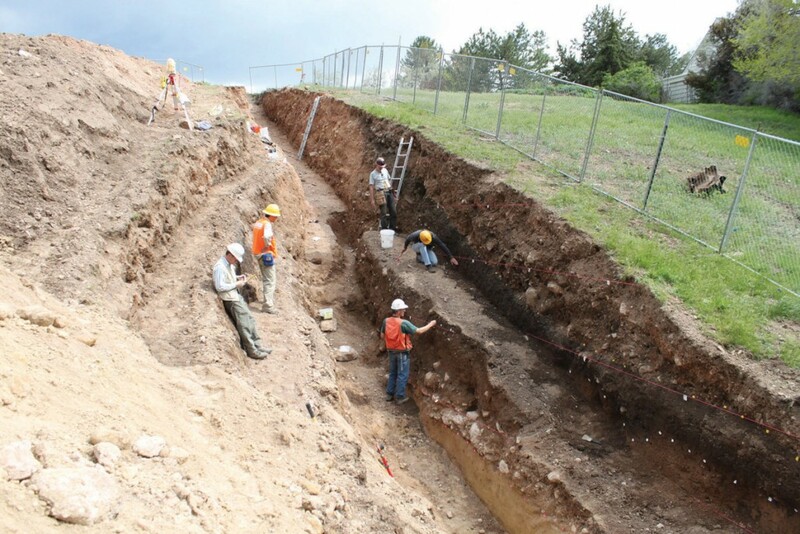 We excavated a total of three trenches across the scarps and exposed geologic deposits as old as about 35,000 years, including evidence of fault movement dating back to about 15,000 years ago when the site was deeply submerged beneath the waters of Lake Bonneville. Geologic evidence indicates four or perhaps five post-Bonneville highstand earthquakes, each one displacing the ground surface vertically by about 1.5 feet and resulting in about 6 feet of vertical displacement of the pre-highstand Lake Bonneville deposits. Determining the timing of prehistoric earthquakes involves dating geologic deposits that are closely associated with fault movement. Two methods that we have found most useful are radiocarbon dating, which measures concentrations of the radioactive isotope carbon-14, and optically stimulated luminescence (OSL), which measures the effects of “trapped” electrons that accumulate over time in the mineral grains of buried sediment. We analyze our dating results in a computer program that uses the geologic deposit ages to mathematically model the timing of fault movement. Although this is a rigorous process, the resulting earthquake times typically have uncertainties of hundreds of years, so comparing earthquake times on different fault zones is somewhat problematic. Still, our results for this study show close similarities in the timing of West Valley fault zone and Salt Lake City segment earthquakes, and suggest that West Valley fault zone earthquakes likely occur in response to earthquakes on the Salt Lake City segment. We cannot presently determine whether West Valley fault zone earthquakes occur coseismically (nearly instantaneously) with Salt Lake City segment earthquakes, or are triggered by them, occurring as aftershocks hours to perhaps months later. To help answer this question, we are looking at historical analogs of antithetic faulting from elsewhere in the world, including the 1984 Devil Canyon earthquake (M 5.8) in Idaho, 1980 Campania–Basilicata earthquake (M 6.9) in Italy, and 1954 Fairview Peak (M 7.2) and Dixie Valley (M 6.8) earthquakes in Nevada. Additionally, we are evaluating the possible role of antithetic faulting in the 1934 Hansel Valley earthquake (M 6.6), Utah’s largest historical earthquake. Our recent studies of the West Valley fault zone and Salt Lake City segment are part of a broader effort to continually improve our understanding of Utah’s earthquake hazards and risk. Ultimately, our goals are to increase public awareness and understanding of earthquake hazards, provide information used in building codes for the safe and cost-effective design and construction of buildings and other structures, and contribute to the development of public policies that lead to more effective earthquake-preparedness and emergency response efforts in Utah. Our study of the West Valley fault zone and Salt Lake City segment was partially funded by the National Earthquake Hazards Reduction Program. The study results are currently available in a Final Technical Report that can be obtained through the U.S. Geological Survey’s External Research Support web page (http://earthquake.usgs.gov/research/external/reports/G10AP00068.pdf). The report has been more formally released by the UGS as part of the Paleoseismology of Utah series, Paleoseismology of Utah, Volume 24 – Evaluating surface faulting chronologies of graben-bounding faults in Salt Lake Valley, Utah – New paleoseismic data from the Salt Lake City segment of the Wasatch fault zone and the West Valley fault zone.